Personally, 2017 has been the year I rediscovered my love for ‘Anime and Bliss’ over ‘Netflix and Chill’. Whether you’re a newcomer trying to understand what the big deal is, or someone who’s looking to reignite their love for the genre, you’ll find something in this list. For the uninitiated: Attack on Titan is a series where humanity has been nearly exterminated by Titans - giant humanoids who devour human beings. This is one of those series you need to watch from the beginning! The beauty of this series is how it weaves together storytelling, art and atmosphere and then slaps you in the face with brutal twists and turns. While the first season focused on establishing the premise and protagonist Eren, the second season is more focused on his comrades, their relationships and how they’re dealing with the possibility of complete extinction at the hands of Titans. For the uninitiated: You probably know what Pokémon is, but if you’ve never understood what the fuss is about, this is a good place to start. Yes, Pokémon! I do love an occasional throwback to the global phenomenon that once made me wish there was more to my dog than sniffing butts. Simply put, this movie is a work of love. It pays homage to Ash Ketchum and Pikachu’s original journey while giving newcomers an enjoyable introduction to this world. Sometimes these origin stories can feel like a drag, but I Choose You is a definite exception, so check it out! 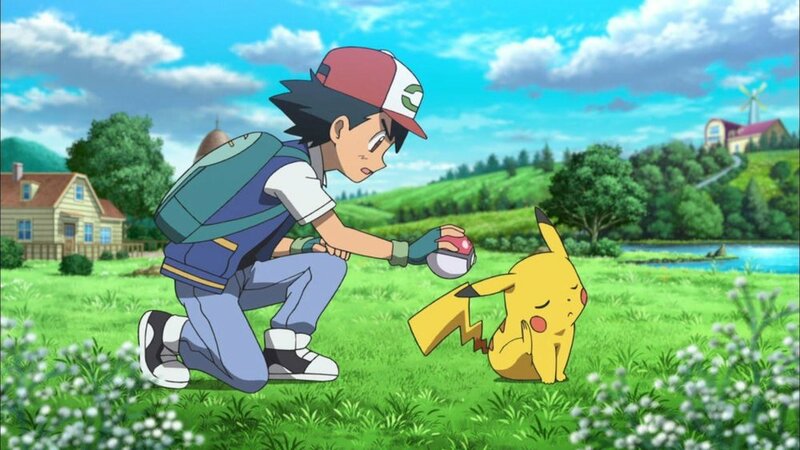 Even if it's for nothing else but to see Ash and Pikachu squabble. I spent quite some time pondering whether this movie deserves to be on the list, but finally gave in because there’s a lot to love about Blame!, and just a few bits to dislike. The movie is set in a distant future where machines have taken over and humanity is trying to survive in this new world. The premise might be familiar, but the execution is not. Without spoiling too much, I can say that Blame! will leave you with a lot of questions, which will hopefully get sorted out in sequels. But for now, just if you want to watch a gorgeous anime with some great action and visuals, just give this one a go. For the uninitiated: Catching up on Dragon Ball and Ball Z alone will take you a lifetime, so I recommend quickly browsing through the plethora of timelines available online and jumping straight into this series. I know it’s just not the same anymore and it just seems like they’re milking the franchise but c’mon it’s Goku – One of the most iconic heroes in the world, almost on par with Superman. While the series did have a sketchy beginning with weird powerups and shameful animation, it has quickly muscled back into it’s prime and is definitely worth another shot. Goku and the rest of crew is still likeable as ever and the fight scenes are just as adrenaline fueled, if not more. Watch this for nostalgia, or if you seriously want to return to the world of Dragon Ball. For the uninitiated: Animes are not limited to action and fantasy, there is an entire world out there which delves into realism just like any popular live action series you might like. If you can get past that stereotype, this one is sure to deliver. This is a deviation from the general adventure/action tone of this list but it’s just so good! The series is so rich with character development and pulsating drama that you can’t help but feel a barrage of emotions for protagonist, Rei Kiriyama. The setup is simple, Rei is struggling through the ups and downs of life while maintaining a professional shogi career and dealing with the loss of his family. This one is right up there with any hard-hitting drama series and even has two live movie adaptations. For the uninitiated: The franchise is set in a world where almost everyone is a ninja and war is a way of life. Without spoiling too much, I strongly recommend you watch Naruto in it’s entirety before even getting into Boruto. Besides Dragon Ball, Naruto is another franchise that has had a huge impact globally. Boruto: Next Generations, takes the next step in the franchise following the footsteps of Naruto’s son as he finds his shinobi way. What I love about this show is the fact that it completely shifts the focus from Naruto, something that TV shows always fear of when it comes to franchises. This show has everything - slick animation, great characters and plenty of nods to the predecessor series. They might be milking this franchise too, but they’re damn good at doing it. For the uninitiated: My Hero Academia centers around Izuku Midoriya, a boy born without quirks (superpowers) in a world where everyone has them, but never gives up on his dream of becoming a superhero. With only two seasons under it’s belt, this is a good time as any to get into the series. No other series has made a bigger splash in the past year like My Hero Academia. This show has it all – Underdog protagonist, underlying themes of struggle and competition and really strong character development. Did I mention the fight sequences? It’s downright jaw dropping how slick the animations look. The best part is that they’re barely any drawn out fights which seem to keep going forever. The second season takes the entire series up a notch and is a league above the rest this year. Captain's Log: Prateek Pant enjoys anime, video games, and valiantly attempting to defend the DCEU to non believers. Newer PostBar Wars: A Night of Star Wars Bar Hopping in L.A.